Twenty five years ago Sankey diagram were drawn by hand, like this one… Depicted are energy flows in the city of Dresden. No colors, just black-and-white with hatching. neat architect’s lettering. 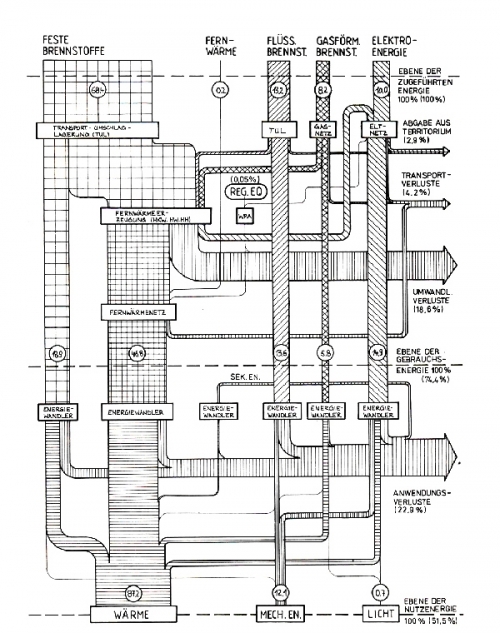 Found this on a website of Bauhaus University in Weimar titled “Interactive Sankey Diagrams – a planning and information tool”. Authors are Hanfler, Fröhlich, Riehmann. 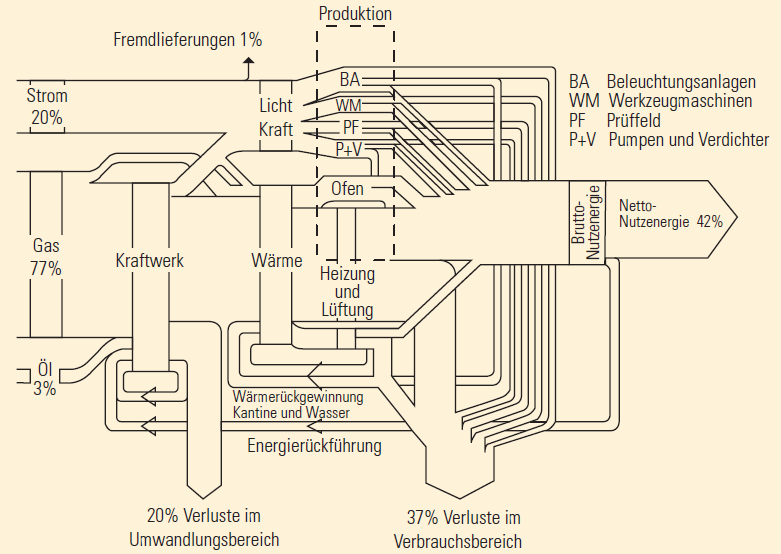 Found this Energy Flow Diagram for Bavaria (Germany) on the Bavarian Ministry of Economy website. 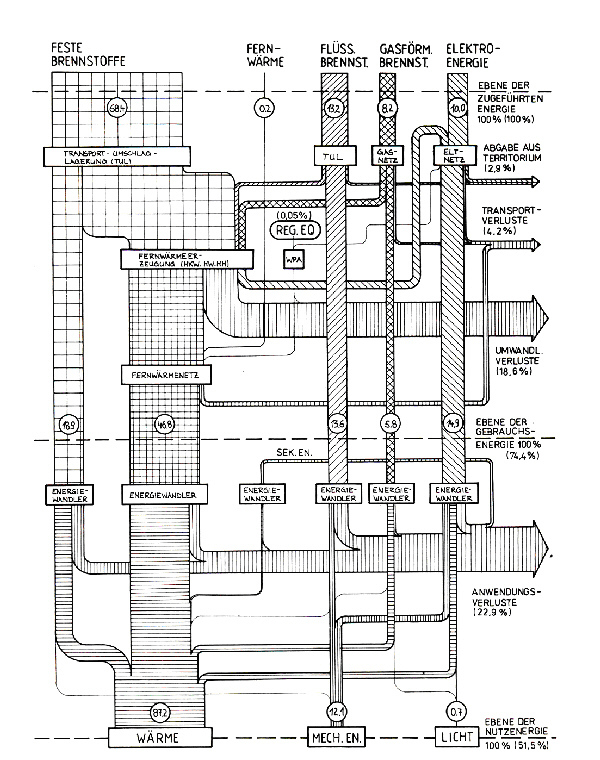 While I generally welcome the fact that these Sankey diagrams are published for nations, regions or states (as is the case here / more examples can be found here on the blog! ), I find that care must be taken to respect the basic principles used for these diagrams. Not a good example. I would have expected better from the state where two of my favourite cars are manufactured. 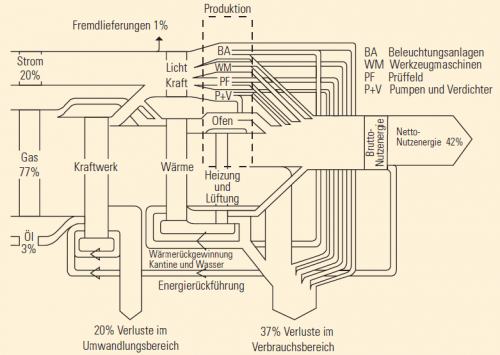 A brochure on efficient use of energy in manufacturing processes in industry was published in 2004 by Bavarian environment agency (LFU). With its catchy title ‘Protect Climate – Reduce Costs’ (German: ‘Klima schützen – Kosten senken’) the brochure targets at small and medium sized companies and aims to raise conciousness about energy efficiency in different areas of a manufacturing company such as pressurized air, air condition, heating/cooling, lighting and others. The first diagram is in percent of the total energy consumption, directing the interest to the areas that contribute most to energy consumption, losses (and energy costs) in the company. 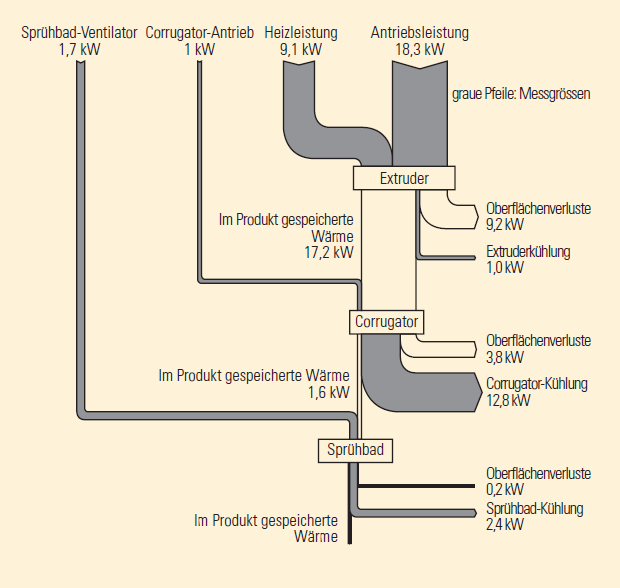 In the second diagram the unit is kW. 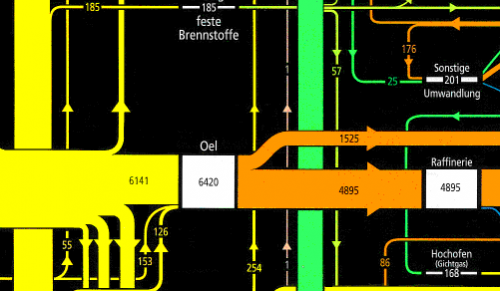 Thanks to the blog reader who sent in the brochure and helped out in translating from German. 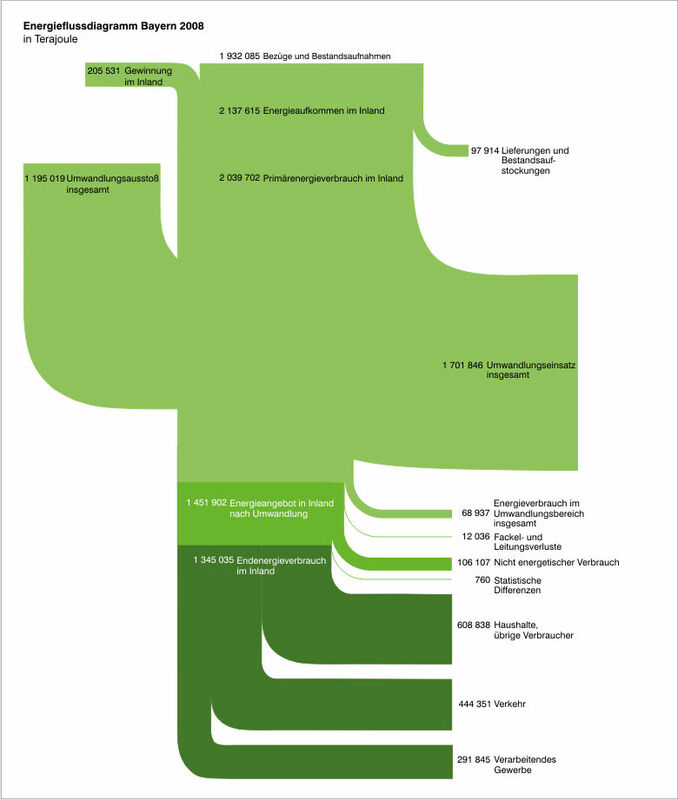 This simple Sankey diagram is displayed on the Berlin state environmental protection agency (in German only). It shows a breakdown of the input materials and of the outputs of a pharmaceutical synthesis process, with a focus on solvents (“LM”). Water is the largest chunk of the inputs, as well as on the output side (I understand that the water is polluted with solvents after the synthesis and need special treatment). Flows are in kg, and mostly to scale. The Sankey arrows for the smaller quantities like the actual product yield (90 kg only) seem to have a minimum width or are emphasized ny a stromger border line in order to remain visible. 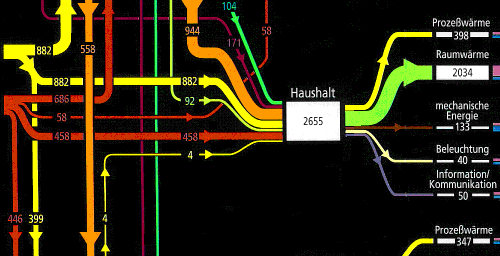 I was asked what the largest Sankey diagram I have seen so far was? Not sure about this. 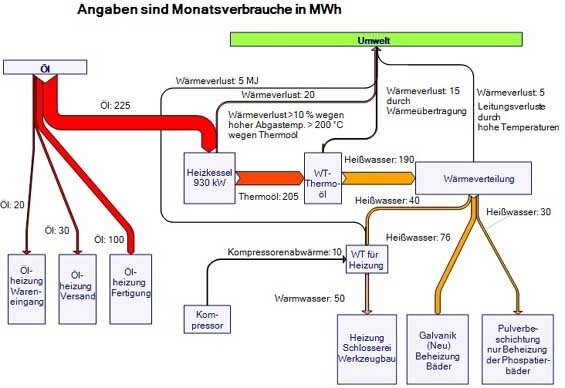 The Swiss biomass flows diagram I featured in January 2009 would be a candidate, but I think the following one is much larger, both in the actual diagram size, as well as in respect to the number of nodes and arrows.